Alexander Hamilton is commonly seen as the standard-bearer of an ideology-turned-political party, the Federalists, engaged in a struggle for the soul of the young United States against the Anti-Federalists, and later, the Jeffersonian Republicans. Alexander Hamilton and the Development of American Law counters such conventional wisdom with a new, more nuanced view of Hamilton as a true federalist, rather than a one-dimensional nationalist, whose most important influence on the American founding is his legal legacy. In this analytical biography, Kate Elizabeth Brown recasts our understanding of Hamilton’s political career, his policy achievements, and his significant role in the American founding by considering him first and foremost as a preeminent lawyer who applied law and legal arguments to accomplish his statecraft. In particular, Brown shows how Hamilton used inherited English legal principles to accomplish his policy goals, and how state and federal jurists adapted these Hamiltonian principles into a distinct, republican jurisprudence throughout the nineteenth century. When writing his authoritative commentary on the nature of federal constitutional power in The Federalist, Hamilton juxtaposed the British constitution with the new American one he helped to create; when proposing commercial, monetary, banking, administrative, or foreign policy in Washington’s cabinet, he used legal arguments to justify his desired course of action. In short, lawyering, legal innovation, and common law permeated Alexander Hamilton’s professional career. 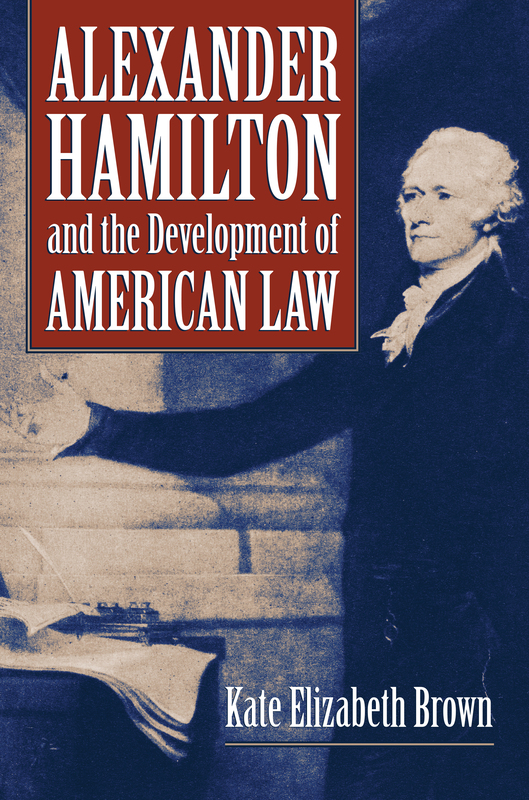 Re-examining Hamilton’s post-war accomplishments through the lens of law, Brown demonstrates that Hamilton’s much-studied political career, as well as his contributions to republican political science, cannot be fully understood without recognizing and investigating how Hamilton used Anglo-American legal principles to achieve these ends. A critical re-evaluation of Hamilton’s legacy, as well as his place in the founding era, Brown’s work also enhances and refines our understanding of the nature and history of American jurisprudence. Kate Elizabeth Brown is assistant professor of history and political science at Huntington University.